At the start of the year, every year, I choose a word to guide the next twelve months ahead. I have been doing this since I was twelve years old, and over the past two-and-a-half decades, the words have varied from being direct to esoteric. The mantra I chose last year, “be kind,” seem to be having a renaissance this year: at least a dozen people have mentioned to me that their guiding words and goals for 2019 will be kindness. For this, I am grateful. The world needs more kindness, especially now. Each word has its merits, its relevance and resonance. Each word is an opening towards opportunity, a different way of looking at the world and what it will throw at me in the next fifty-two weeks. I am having trouble deciding which one to choose. Perhaps my indecision is a marker, a sign that my word should be something even more direct: “choose,” “decide,” or even “it doesn’t matter.” Maybe it means that I still need time to think about the year to come and what I hope to get out of my days. Maybe it means that sometimes you don’t have to worry about choosing a path—that the right path, the right guiding word, will come to you when it must. As 2018 came to a close, I reflected upon the year gone by in my “a year in kindness” blog post—a look back on my mantra of the year, “be kind,” and how kindness permeated the year—and also shared my year in reading and year in popular culture. Scaachi Koul, as always, captures the past twelve months perfectly: 2018 wore us all the hell out. I wish I had a real solution for the kind of tired that sinks into your bones because it’s not just about your life — in fact, my life is extremely decent, considering how privileged and fortunate and not deported (fingers crossed) I am, so if I’m complaining, I have to guess a lot of other people are complaining too. This feeling is bigger than burnout; it’s an almost cosmic kind of hopelessness. It feels impossible to keep fighting, even if you win from time to time. The only real antidote I’ve found for this is to commiserate with people who feel it too. Find someone who’s tired like you, who will take care of you when you’re too exhausted to do it yourself, and who will fight the fight when you can’t lift your arms anymore. Perhaps more than anything, letters slow down the pace of life. I often feel compelled to respond briefly to an email message that appears in my inbox just to clear it out of the way. There is no joy in the response. I’m just getting it done as quickly as I can in order to move on to what’s next without it nagging at me. Letters take time to compose. They take time to get where they are going and take time in getting answered. I see a letter correspondence as a kind of pace car to the speed at which I want to live my life. If it doesn’t scale, it doesn’t matter. The media are easily excited by demonstration projects, but this idea doesn’t scale. You could build lots of tunnels, and they would each move so few people that they wouldn’t make a dent in a city’s transport needs. One of the things I’ve noticed most about working from home is that I don’t get as many hugs every day as I used to get when I worked in an office. Why do we hug each other—and why is it so important that we do? Though I am lacking in many ways, I want to be a person who can bring some small comfort to people, who can give them courage, like a ray of warm sunshine. If there is someone who needs a hug from me, I will do it willingly, gladly, and as often as they need. Those of you who are reading this, if you have family or friends who are going through a hard time, please remember to give them a warm hug now and then. Who knows, you really might extend their lives—and yours, too. If living a full life and being good to ourselves and others now has to be labeled self-care, what does that mean for the actual work of caring for our mental, emotional, physical, and spiritual selves? I also find it depressing that we need to use the term #selfcare to justify regular behaviors at all. I’ve seen people on social media call taking a walk outside during their lunch break #selfcare. Or drinking your morning coffee without checking your email, calling a friend you haven’t talked to in a while: All of it is #selfcare. When we expect self-care to substitute for our larger systemic flaws in our healthcare, we also over-endow activities that should be basic privileges. Instead of finding faults with the more frivolous forms of self-care, and their pollution of the more “serious” self-care, maybe we should instead feel indignant about how every little moment in our lives needs to be productive and meaningful and presented to the world as such. Something those of us who are affected by hatred have known for our whole lives, but surprisingly still needs to be told to those who have the privilege not to be hated: hatred and bigotry need to be fought, not engaged with cerebrally or academically. Only those safe from fascism and its practices are far more likely to think that there might be a benefit in exchanging ideas with fascists. What for such a privileged group is a matter of a potentially productive difference in opinion is, for many of us, a matter of basic survival. The essential quality of fascism (and its attendant racism) is that it kills people and destroys their lives—and it does so because it openly aims so. Perhaps it is easier to believe that those who attempt to exert power over us do so clumsily, blindly. That they are, essentially, ignorant. It is more difficult—and more enraging—to understand that however narrow-minded they may be, my neighbors in Berlin and my aunts in Accra are not fools. They intend that I feel discomfort. Their goal—with their gazes, their sighs, their asides—is my reaction: that I feel out of place. My weakness has always been that I agree: I am out of place, yes, they’re right. Your reflections have encouraged me to rethink the matter. If their goal is my disempowerment, what is mine? And by what means do I intend to reach this goal? Kudos to Dr. Robin DiAngelo for calling it like it is: white people like her are fragile when talking about race, and that’s something important to fix. White fragility functions as a kind of everyday white racial bullying, quite frankly. We make it so miserable for people of colour to talk to us about our inevitable and often unaware racial patterns, perspectives and investments, so most of the time they don’t. As someone whose day job is focused on creating the best possible experience for everyone in the workplace, the idea that the workplace is killing people and nobody cares is an fascinating, and scary, one. I read this piece on using “the best stuff” while lying on my Casper mattress on my Brooklinen bedsheets after brushing my teeth with my Quip toothbrush, and had some questions about the decisions I made in my life. There is an entire generation of us here — those who are constantly given the message that we can and should have the cleverest couch on the market or have the best item from the fanciest restaurant in town delivered to our door in 20 minutes. It isn’t just a display of wealth; it’s your morality: that you are indeed the Informed Consumer, able to not only afford the best but to know what “the best” even is. It’s a marketing strategy that is not new, of course, but that seems to work particularly well at the present moment. I am so proud to have been able to work with Bianca Wylie in the past—she’s now, quite rightfully, being called the Jane Jacobs of the 21st century—but even more proud and lucky to call her a friend. She is changing the world, and I’m glad to be with her on that journey. This league, this NBA, in this era right now? It’s not about trade demands, or super-maxes, or skinny-type suits. Nah. Nah, man! It’s about all these talented people — realizing together that they haven’t been successful IN SPITE of being themselves. They’ve been successful BECAUSE of being themselves. Now y’all tell me whose legacy is that. I love this collection of recaps of the year by cultural critics and commentators; it’s a mix of seriousness and humor, depth and triviality. I don’t know what was least exhausting. Everything felt exactly as urgent as everything else did, which is probably why I continue to feel existentially tired; movement as self-preservation is an exhausting thing. Whatever. Exeunt, pursued by year. If you’re planning a trip to Toronto anytime soon (or even if you live there and need to get out of your bubble), this Vogue feature on 16 amazing Toronto women and their favourite places in the city is an excellent place to start. This is a good op-ed by Ro Khanna about digital inclusion, the digital divide, and the importance of rural and small urban centers to innovation. Published works from 1923 entered the public domain this week, the first additions in over 20 years. To bring you a smile today: a heartwarming story of a man discovering his father’s years-long friendship with NBA superstar Charles Barkley. 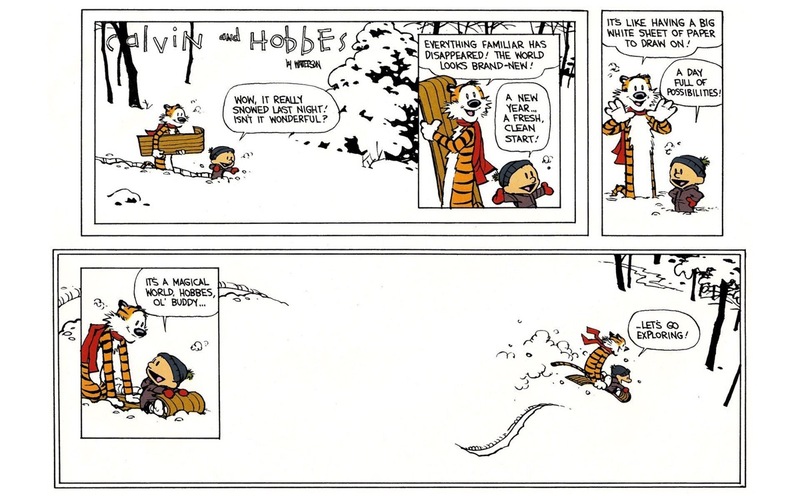 Bill Watterson published the final Calvin & Hobbes comic strip on December 31, 1995. I thought it was a fitting comic to share at the start of this year. Here’s to a year of exploration and wonder, my friends. Talk soon. Want to get this and future weekend reading links in your inbox instead of checking the blog? You can subscribe to the newsletter.